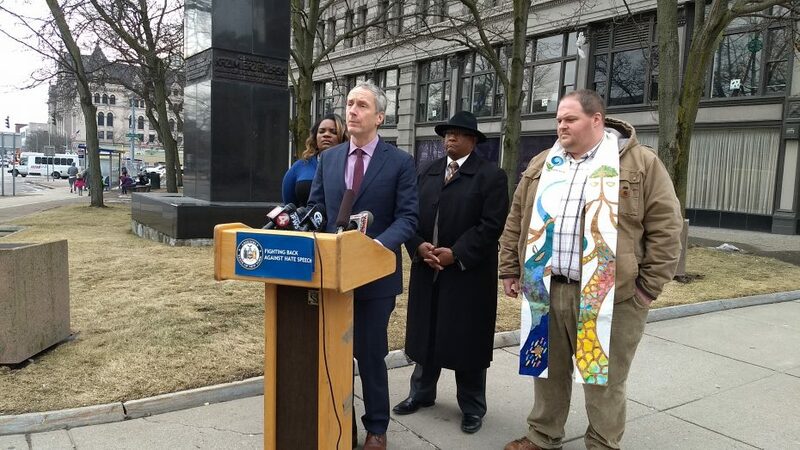 Assemblyman Sean Ryan and other community leaders denounced Carl Paladino Thursday for distributing an email Wednesday suggesting that recent riots in Paris were not just about economic injustice but were the result of a city filled with nonwhite Muslim immigrants and refugees. They held a news conference outside his company's Ellicott Square building and called on businesses and organizations to cut ties with his company, Ellicott Development. "As the victims of New Zealand are being buried, Buffalo business leader Carl Paladino is already back to peddling his brand of internet hatred," said Ryan, D-Buffalo. "Like it or not, the outside world views Carl Paladino as a Buffalo leader, and what he said in this email doesn't represent the City of Good Neighbors." Last week's mosque attacks in New Zealand left 50 people dead. 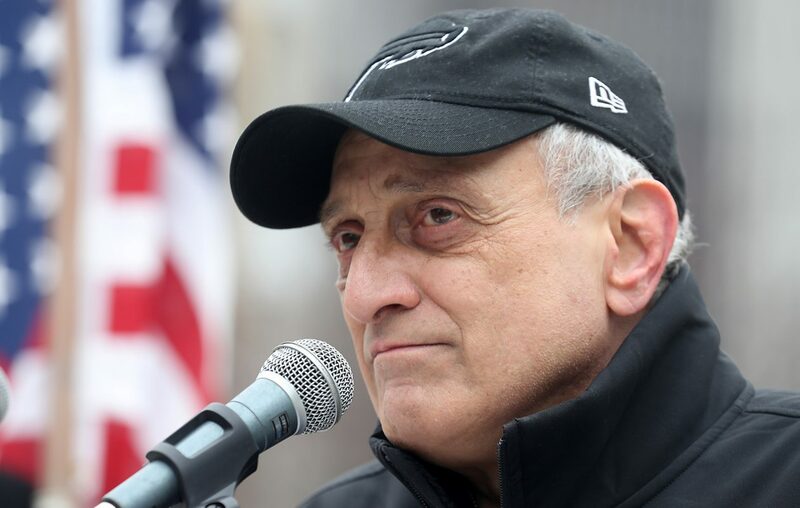 "Muslims have basically overrun these cities in Europe," Paladino responded Thursday. "And from my perspective, that is the truth. If I believe something is true, then people have the right to know. That’s it." The email, which Paladino shared with his extensive list of email contacts, forwarded captions and photos supposedly written by "neutral Czech tourists" in 2018. Titled "19 Pictures from Hell (Formerly Called Paris, The Capital of France)," the email included a series of crowd shot pictures featuring nonwhite immigrants and conservatively garbed Muslim women walking the streets of Paris. It also included pictures of trash-ridden public spaces. It started with this sentence, "Anyone dumb enough to believe the Paris riots are only about taxes and the climate? Take a deep breath and learn." The writer expressed shock that he or she saw few fellow white people in public transportation areas, described the immigrants as destroying the culture and romance of France, expressed disgust at refugee-owned businesses and described the city's landmarks "teeming with hucksters of the African, Arab gambler, beggars from all over the world and pickpockets." The purported writer described the visit as a "terrifying experience." It appears unlikely, however, that a Czech tourist wrote this or posted photos from his/her trip since a number of the photos, which have been circulating online since last spring, appear to have been cobbled together from very different points in time and not all were shot within France. The Paris riots, which have broken out on recent Saturdays, are rooted in the Yellow Vest movement. Its followers have levied numerous grievances against the government over economic disparities, high fuel taxes, climate, wage injustice and other issues. Life-threatening fires and looting marked last Saturday's riots. The riots have come as much of Europe grapples with an upswing of migration since 2015. Paladino said he did not know if the presence of Muslim immigrants was linked to the Saturday riots in Paris and hasn't researched the matter. But based on his visit to France a couple of years ago, the email sounded reasonable to him. "I just sent the thing out for what it’s worth," he said, adding that he didn't include any personal comments to the email. "There’s nothing racial that I recognized in the article. I thought it was truthful." Paladino's emails and comments have been condemned by local leaders before. In December 2016, he referred to First Lady Michelle Obama as a man and said he'd like her to be "let loose in the outback of Zimbabwe where she lives comfortably in a cave with Maxie, the gorilla" in an Artvoice piece. At a 2015 rally, he decried the presence of "damn Asians" and other foreigners at the University at Buffalo and other state colleges. His critics say the hateful remarks like those in his recent email should no longer be shared without consequences. They called on Ellicott Development's tenants and organizations such as Kaleida Health and M&T Bank to stop doing business with the company. They also called on Buffalo Place, which advocates on behalf of downtown property owners, to remove Paladino from its board of directors. "That hatred rubs off on you," said the Rev. Kirk Laubenstein, director of Coalition for Economic Justice. "We started treating him like a crazy, old uncle," Ryan said of Paladino. "But now, we realize we're enabling him." Erie County Legislature Majority Leader April Baskin said Paladino's history of hate speech threatens the safety of minority groups in this country and that the "crazy uncle" analogy is a poor one. "This is not a disruption of Thanksgiving dinner," she said. "This is the disruption of American society, of all of our safety, and that's not to be taken lightly." Buffalo NAACP President Mark Blue said that Paladino's company benefits from a great diversity of tenants, including immigrants, and that if Paladino thinks such newcomers are the root cause of social ills, he shouldn't take their money and should return what his company has already received. "If you don't want to give that back, then shut up," Blue said. Paladino said he's not worried his company, Ellicott Development, will be harmed by the email. He took aim at Ryan, saying he's not going to take direction from a politician who supports "live birth abortions." That's a reference to Ryan's support of the state's comprehensive abortion law in January. Others have made similar claims about the law, which PolitiFact New York found false. The state law repealed some redundant protections for babies in these circumstances. But under federal and state law, infants born alive are due the same medical care and protections as anyone else. "He's got a lot of nerve," Paladino said, calling all the speakers at Thursday's news conference "screwballs." "These people live on another planet," Paladino said. "I think we’re highly respected in the community for our opinions, and I’m going to voice them."